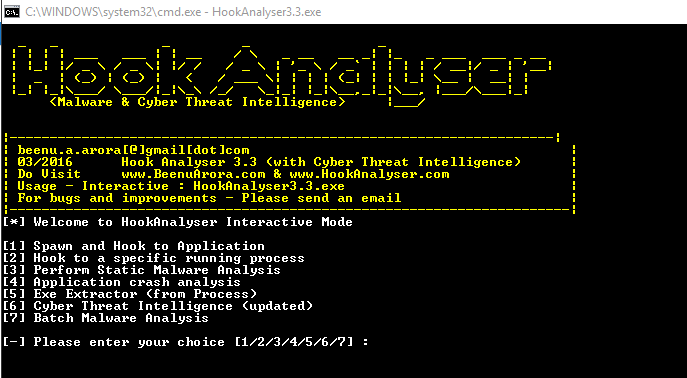 Hook Analyser: Hook Analyser 3.3 Release and A Great News! Hook Analyser 3.3 Release and A Great News! 2015 was an incredible year for Hook Analyser for several reasons e.g. new functionalities introduced, several critical bugs were fixed and of course "the new baby - ThreatIntel module" was added as well. The ThreatIntel module was introduced as a value-add to the malware analysis module/engine. However, I admit that I underestimated its value : The ThreatIntel module has become bigger than ever with over 200 commits in the last 12 months. This is attributed to the requests of Hook Analyser users. I'd like to announce that Hook Analyser was awarded as "Toolsmith Tool of the Year 2015". This wouldn't have been accomplished without the support of loyal Hook Analyser users and admirers. Thanks all for your vote of confidence on this project. As a chief-developer and architect of this project, this recognition does provide me a lot of energy to continue to build cool things. If you have any new idea or would like to partner with the solution, please feel free to reach out to me. The project is becoming bigger each day and if you'd like to contribute to it then give me a shout. You may download the tool from here. In the current state i.e. v3.3, Hook Analyser has got the two (2) key capabilities: Malware Analysis (static and dynamic) and (Open Source) Threat Intelligence (collection, correlation and visualisation). I'd like to announce that one of my other projects - Incident Analyser will be ported into Hook Analyser as a module called "Probe Engine" in the version 3.4. Click here to get information about the next release.